Theresa May is launching an independent review of tuition fees to ask whether there is sufficient value for money for students at UK universities. Almost all courses are charged at the maximum £9,250 per year in England, although that differs in Scotland, Wales and Northern Ireland. From the perks of studying abroad, to being able to escape the monthly payments, there are lots of myths about tuition fees. Newsbeat's taken a closer look. Your student debt sits in an account with the Student Loan Company accruing interest until you've paid it off. If that is £100 debt or £100,000 debt, you'll still only be required to pay the same amount each month. And the amount depends on how much you earn. Students who started uni from September 2012 pay 9% of their earnings over £21,000, although that threshold is increasing to £25,000 in April 2018. Based on the new £25,000 threshold, that works out as approximately £37 per month if you're earning £30,000 - regardless of how much you owe in total. After 30 years student loan debt is written off, regardless of how much is left to pay. There is some truth to the "myth" that you may never pay it off entirely though. According to Money Saving Expert you'd have to have a starting salary of £45,000 in order to be likely to fully repay your student loan. That's "borrowing £9,000 for fees & £8,200 living costs per year, so £51,600 in total. With 3% inflation & graduate earnings growing at inflation + 2% per year". The amount you pay back is based on your earnings and is different for each country you live in. So you should get in touch with the Student Loans Company if you intend on moving abroad for more than three months. They will calculate how much you should be paying back based on your prospective earnings. So bad news, moving abroad won't free you of your student debt. There's also a few caveats to this one. The Scottish government covers tuition fees for Scottish and European Union students - excluding those from England, Northern Ireland and Wales. So in short, if you live elsewhere in the UK you'd still have to pay if you study in Scotland. It's a little different in Wales and Northern Ireland too. 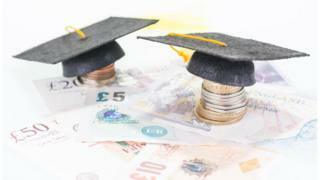 When annual tuition fee caps were upped from a little under £4,000 to £9,000, the Welsh government said they would pay the difference for Welsh residents at UK universities. And Northern Irish residents studying in NI pay less than £4,000 per year too. Everyone else has to pay the full amount. Student loans aren't marked on your credit file, so they don't have the same impact as other loans and debts. But mortgage lenders will do an affordability test which takes into account all outgoings each month - including student loan repayments. So that could result in you being denied a mortgage.